John Nash Hogan and his key worker, Stephen Lawlor, have been working together for just over a year in Kilbride House. As John’s key worker, one of Stephen’s responsibilities is to support and encourage John to set life goals for himself based on his wants, needs, and wishes. 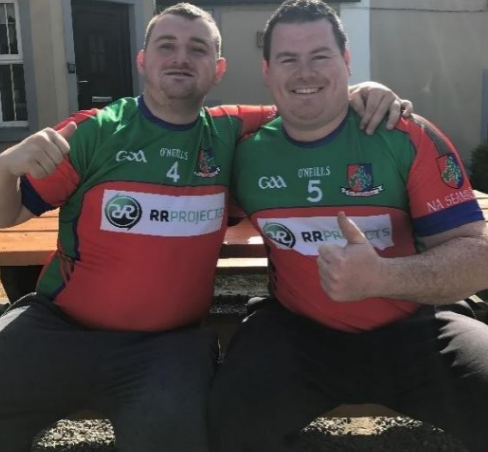 One such goal of John’s has always been to play GAA for a local club and over the past 12 months, Stephen has actively supported John to edge closer to achieving this goal. John has since joined his local football team, ‘The Shamrocks’, and his own football team, ‘Tullamore GAA’. This is a truly fantastic outcome for John who now trains once a week, volunteers as Maor Uisce at big games, umpires at other games, and has formed great relationships with his team mates. Throughout the year, John and his key worker have rubbed shoulders with many GAA professionals; Brian Galvin (All-Ireland referee) and Shane Dooley (Offaly hurler) to name two. Stephen has also worked in tandem with John’s wishes, recently sourcing supported employment for him in the Tullamore GAA Club where he carries out maintenance works. Stephen & John have done tremendous work over the past year together. They are both strong team players and have worked hard to create a very positive environment. Congratulations to all involved.